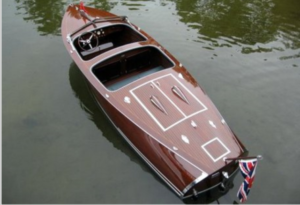 This “special” 21.5 ‘ Greavette was built for Col.Moody, Vice President of Greavette Boats in 1936 and was one of only six hulls produced in this length. The uniqueness of this particular boat was that it was the only one with covered decks from the rear seat aft and was given “fancy upgrade” consisting of a custom windshield, steering wheel, instrument cluster and hardware and named a “Custom” whereas all of the others were “Utility” hulls with an open rear cockpit and a motor box and standard hardware, basic instrument gauges and steering wheel. This makes this Greavette a “one of a kind” collectors antique. The boat was named “Rob Roy” after the Moody’s two sons “Rob” and “Roy”. Mr. Bruce Wilson, subsequent owner of Gravette Boats, acquired Rob Roy in the 1960’s, replaced the original bottom and re-powered the boat with the current Chevrolet “327”cu.in. V8 engine. Rob Roy was purchased by Mr. R.E. McDermott, Port Carling ,ON , where it was boat housed at his summer cottage near Mortimer’s Point, On. Dr. Hugh Boyes purchased Rob Roy from Mr. McDermott in July 1978, and it has remained at his cottage/boathouse at Mortimer’s Point since that time. Dr. Boyes had Rob Roy restored by Gary Clark, Clark Wooden Boats in 1982/83 where the boat received new decks, engine hatches, interior, dash, upholstery, floors, wiring, gauges, complete varnish and re-chrome and the boat was re-named “AliCat” after his daughter “Ali” and wife “Cathy”. During the fall of 2016 the “AliCat” underwent a refurbish by James Osler where she received a complete new transom and re varnish of the decks and sides. The boat is currently on display at the antique boat museum “Grace and Speed” in Gravenhurst, ON.